I have read advice columns suggesting strategies for eliminating stuff. One criteria given is usefulness. If something has not been used for a period of time, you should get rid of it. Another strategy uses a criteria of joy – encouraging people to acquire and/or keep objects which bring them pleasure and discard those that don’t. The challenge that keeps me immobile is the realization that some stuff is just stuff, useful, enjoyable or otherwise, but other stuff has meaning. Getting rid of meaningless stuff that is no longer useful or enjoyed is not really a problem (other than the time and effort involved in disposal). The problem is that for me, many objects have meaning. I have kept them because of what they mean to me, even when they take up space or are not useful. Different stuff means different things to different people. For me, the meaning and value of a particular object lies in memory and its association with a person who is meaningful to me. Some objects I like and keep because they evoke memories of a particular place or an event in my life. This can be objects from my childhood or things brought back from vacations. The memory is important, so the object remains as a reminder. Things that I have put effort into making also seem to have more meaning to me and destroying or tossing them out seems to negate the effort put into their creation. Objects created or made by someone significant to me are also very meaningful, especially if the object was a gift to me. To get rid of such things seems an insult to their effort. Other objects owned or used by someone significant also have meaning, more so if that person is no longer living. The object remains as a reminder of the person and relationship. So maybe my challenge is to somehow preserve the good memories without having to keep all of the stuff involved. There are ways to do this. Written stories, journals and letters preserve memories, but can also accumulate and become a burden. Photographs can preserve a memory without taking up much space (though sometimes the boxes of random prints can be a burden just as well). Technology does allow us to organize and store photographs and written material digitally or online, which solves the space issue, but still leaves challenges of organization and remembering what is where. I have started digitizing documents and letters and making a digital catalog of things such as old books and family made art work and crafts. Sharing stories related to objects of family history significance is something that I can do in a blog. Of course I do not need to keep everything that belonged to a certain person in order to maintain the memory of them. Sometimes one single significant object can serve that purpose. Other objects could be given to others as a memento for them. I can more easily let go of something that belonged to a deceased loved one if it is given to someone else who cherishes that memory and is trusted to care for the object. I am just not sure if many in my children’s generation have that sense of stewardship of family history, especially when it involves people that they did not personally know. I can try to share and record the stories attached to objects and instill in younger generations the meaning and importance, but once the object is out of my hands I have no control. If I wait too long, their tendency might be to throw out most everything. My father has offered much of his stuff to his children and grandchildren. This is good to do while he is still living and has some control of who gets what. Many families have actual fights over such possessions after someone dies. Monetary value seems to be an issue for some in desiring or keeping particular objects. This doesn’t make much sense to me. If someone sees a family heirloom as valuable because of it’s cost, are they just wanting the satisfaction of possessing a valuable object or are they intending to sell it and use the money for something of more value to them? Wouldn’t an heirloom be better owned by someone who appreciated the history and meaning of it? It almost breaks my heart to go to estate sales and see things that to me would seem meaningful to a family being sold along side ordinary household items. The idea of usefulness can play a part in making determinations about what to keep. Meaningful and useful objects would seem to take priority over objects that are just taking up space. Finding a creative way to use meaningful objects, especially incorporating them into decor would make sense and also relates to the joy factor. I do find that having meaningful objects around where I frequently see them is enjoyable and preferable to just knowing that they are tucked away in a box or closet. Others, not understanding the significance, might think such things were out of place or detracting from the decor (making it look like I live in a second hand store), but if this is where I live that is what should matter. Of course, any or all of my material possessions could be destroyed or lost instantly through a natural disaster. And it will all be left behind when I die. After all, it is just stuff. How much should it really matter? What is most important are relationships – memories of relationships, and maintaining good relationships now, unmarred by fights about stuff. 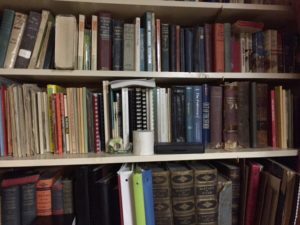 So I will continue what I have begun and what looks to continue as a long and laborious process – sorting, deciding, cataloging and sharing, giving away and throwing away stuff. Since there is no second chance if there are second thoughts after discarding something, I will probably continue as I have in the past, being cautious and keeping some things a while longer, then looking at them again later to perhaps get rid of them then. Maybe, hopefully, I will be able to complete this process before I die or am sent off to some small Assisted Living quarters. 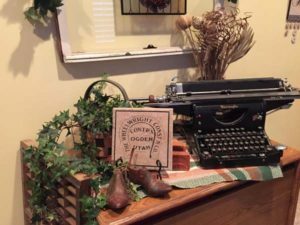 This entry was posted in Family heirlooms, My Stories of Discovery and tagged heirlooms, Record keeping. Bookmark the permalink.